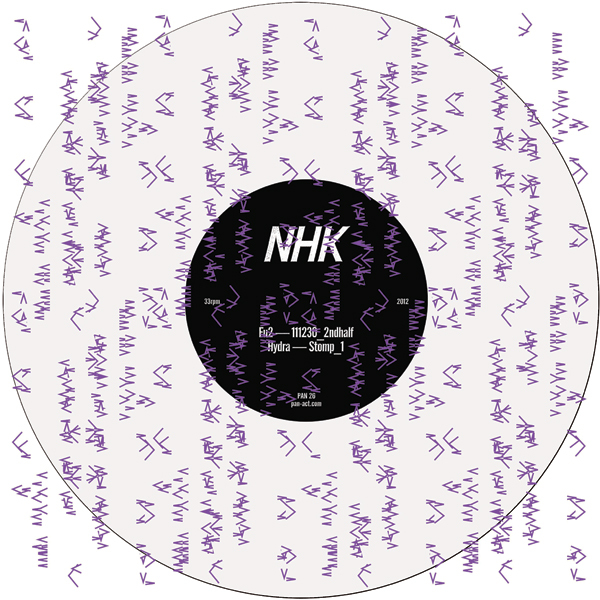 Split 12″ between two of the artists at the forefront of the experimental dance scene, SND and NHK. Aside from sharing 3 letter names and having an upcoming Japanese tour together, the two acts also nicely compliment each other via skewed electronics which come out of mutual dance and minimal electronic sensibilities. SND offer a cut of jacking minimal loops, flows of repetition crafted at once as structured yet simultaneously unfolding before your eyes (and ears), whilst on the flipside NHK is suitably equal part bass squelch with rudimentary snare motorik via pirate radio broadcast. SND formed in Sheffield, UK, in 1998 by Mark Fell and Mat Steel. Three critically acclaimed albums for Mille Plateaux alongside the continuing series on their own label put SND at the forefront of new digital minimalism, pioneering a sound that always influenced but also resisted the so called ‘clicks and cuts’ movement that built up around them. After their third album — Tender Love — for Mille Plateaux in 2002, SND became disillusioned with the recording treadmill and proliferation of the genre they seemed to inhabit, and turned to other projects; solo work, curating events and installations, the occasional contribution to compilations, an album for Raster Noton from side project ‘Blir’, remix work for the likes of Ryuichi Sakamoto, and sound design for fellow Sheffielders The Designers Republic. During this time they also honed their impressive live performance through extensive touring of Japan, America, and Europe (most notably with Autechre), and one off shows at major festivals and venues around the world. Experiencing an SND performance can be alienating, engaging, dynamic, and unforgiving; each event a unique exploration of the relationship between performer, audience, software and context. Snd continued an active year with another European tour supporting Autechre, a reworking of Billie Jean for the ‘Recovery’ box set on Fractured Records, a major feature in the Wire magazine, a tour of Japan and the recording of another album. NHK formed in 2006 in Osaka, Japan by Kouhei Matsunaga and Toshio Munehiro. Mainly as a side project of prolific producer Kouhei Matsunaga (who is working under many different aliases such as NHK’Koyxen, NHKyx, Internet Magic, Koyxen), they started making experimental dub techno with a more raw and harsh edge to it. Kouhei has released numerous albums on labels such as Skam Records, Wordsound, Raster Noton and his first ever album “Upside Down” on Mille Plateaux in 1998. He has also collaborated with artists like Merzbow, Jungle Brothers’ Sensational, Autechre’s Sean Booth, Mika Vainio, Conrad Schnitzler, Anti Pop Consorium’s High Priest, Rudolf Eb.er, Puppetmastaz crew, Asmus Tietchens, Ralf ‘RLW’ Wehowsky and so on. His own label Flying Swimming was founded in 2002 with the main purpose being to publish and curate events of experimental contemporary music and art. The Lp is mastered and cut by Rashad Becker at D&M, pressed on 140g white vinyl which itself is housed in a silk screened pvc sleeve with artwork by Kathryn Politis & Bill Kouligas.